Attorney General Jeff Sessions addresses the National Law Enforcement Officers Memorial Fund 30th annual Candlelight Vigil. WASHINGTON – U.S. Attorney General Jeff Sessions is adding more than 300 new prosecutors around the nation to fight the opioid epidemic, violent crime and immigration violations. The 311 new assistant attorney positions are set to be announced Thursday and will mark the biggest addition of prosecutors in decades, the Department of Justice said. The prosecutors will be deployed throughout the U.S. with 190 focused on violent crimes, 86 on civil enforcement and 35 on immigration-related crimes. 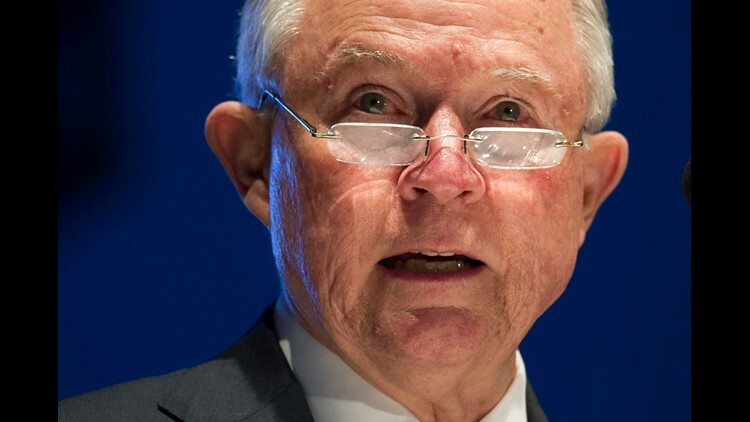 "Under President Trump's strong leadership, the Department of Justice is going on offense against violent crime, illegal immigration, and the opioid crisis — and today we are sending in reinforcements," Sessions said in a statement. The new positions will cost the Justice Department a total of about $72 million but some of the initial costs were made available by cutting what Sessions said called "wasteful spending" within the department. The Justice Department's 2018 budget laid out $1.5 billion in funding redirections and $702 million in program eliminations and reductions, all of which would have helped pave the way for the hirings. "I have personally worked to repurpose existing funds to support this critical mission, and as a former federal prosecutor myself, my expectations could not be higher," he said. "These exceptional and talented prosecutors are key leaders in our crime fighting partnership." Sessions said many of the new positions in civil enforcement will be focused on his department's newly created task force targeting opioids. Opioid distributors and manufacturers have been a focus of the department since startling statistics showed a recent massive jump in deaths. In 2016, more than 42,000 people died of overdoses from opioids, a class of drug that includes powerful prescription painkillers such as OxyContin and Vicodin; illegal heroin; and fentanyl, a strong synthetic drug sold both through prescriptions and on the street. In March, President Trump and Sessions urged federal prosecutors to pursue death penalty charges in some drug cases in hopes the harsh penalty could counter the opioid scourge. In another move last month, Sessions proposed a change to drug policy that would limit the amount of opioids companies can manufacture. More than 250 lawsuits have been filed by cities, counties and states all targeting makers of the drugs and alleging misleading marketing tactics that fueled the epidemic. Illegal immigration, a centerpiece of Trump's campaign, has also been a priority for Administration. Arrests of illegal immigrants across the U.S. have increased by 40% since Trump took office, many arrestees did not have a criminal history. The 35 new prosecutors are in addition to another 35 assistant attorneys and 18 judges that Sessions deployed earlier this month to the southern border, even though arrests at the border are at historic lows. The deployments came amid a caravan of Central American migrants who hoped to travel to the U.S. for asylum. Sessions said the influx of attorneys will send "a message worldwide: Don't come illegally. Make your claim to enter America in the lawful way and wait your turn. He first made mention of his massive expansion of new attorneys last summer in a speech in Las Vegas, vowing to relocate money within the Justice Department to hire more prosecutors in order "to fight the scourge of crime." Discussing the murder rates, opioid distributors and arrests of illegal immigrants, Sessions said Americans cannot accept living in fear. "The first and most important job of this government — and any government — is to protect the safety and the rights of its people. If we fail at this task, then every other government initiative ceases to be important," he said. "As law enforcement officials, we have the responsibility to stop — and reverse — the surge in violent crime and opioids that has taken place over the last two years."